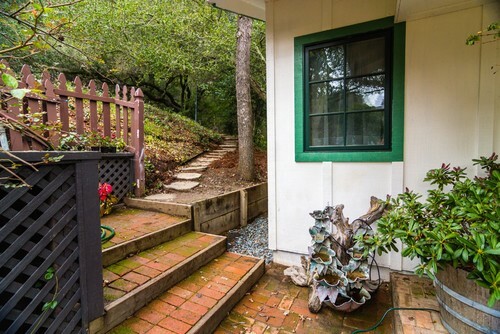 Today's featured small space is a one bedroom Spanish style cottage in Orinda, California. Our story begins with a young family in Northern California and a mother/grandmother living in Southern California. 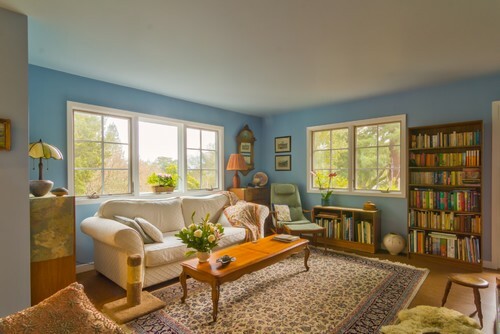 When the family outgrew their first home they purchased a larger house on a lot that could accommodate a second smaller residence for the grandmother. A patio entrance affords space for outdoor living. 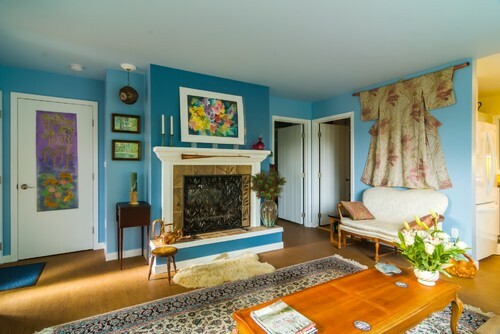 Decorated in happy colors and eclectic furnishings, this cottage evokes a casual, relaxed atmosphere. 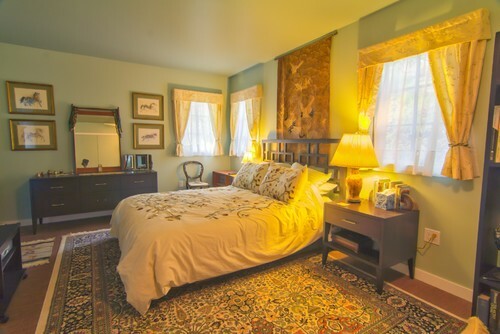 Here you'll find traditional mixed with mid-century modern and vintage pieces. A lovely kimono of soft colors is displayed on one wall. Books fill large and small shelves, adding warmth and interest. 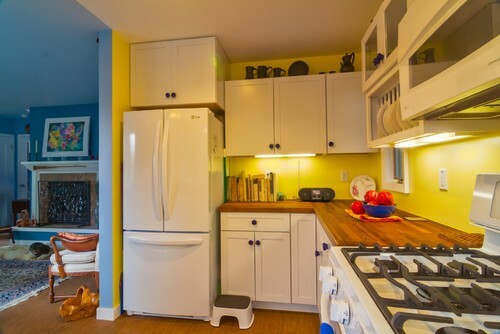 The kitchen is bright and cheery thanks to plentiful natural light and primary colors. The fireplace has double-sided glass that faces both the living room and the bedroom. Subdued color in the spacious bedroom sets a tranquil tone. I'm a firm believer that a home should reflect the taste of its owner, not that of a designer magazine. White cottage style wall cabinet and door with Mediterranean tile? Why not? This is a smashing look. 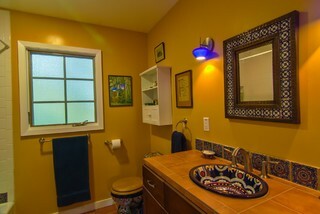 Even on a dreary day, this bathroom would be sunny. I can only imagine the joy this grandmother feels every day in this darling cottage so close to her family. Utterly charming. Wish my kids had a yard big enough for a little place like this. 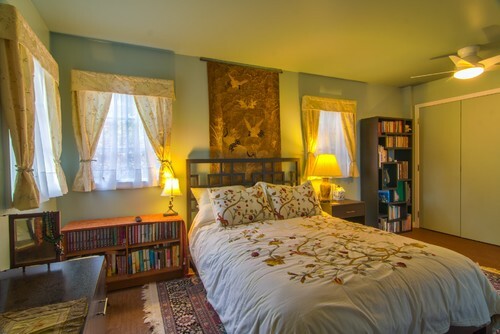 Absolutely perfect for a grandmother and room for the family to visit. 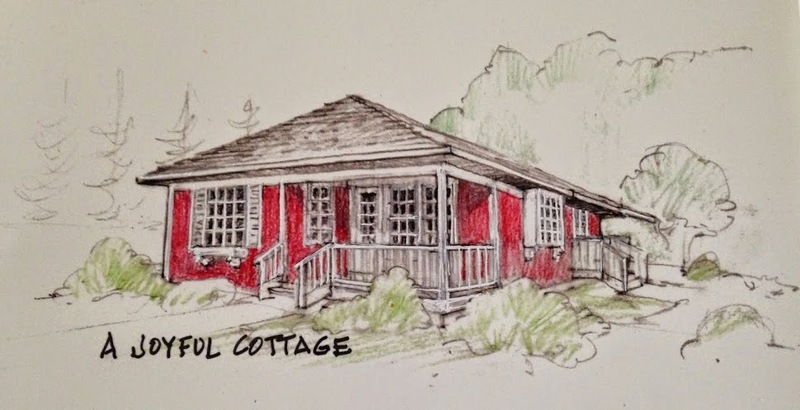 I find this cottages architecture graphically appealing with the accent of color against the White. 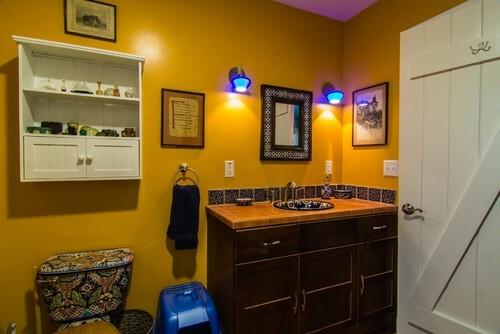 Love the punch of color in the Cobalt kitchen pendants. I enjoyed this post, thanks. Super sweet and charming Nancy. 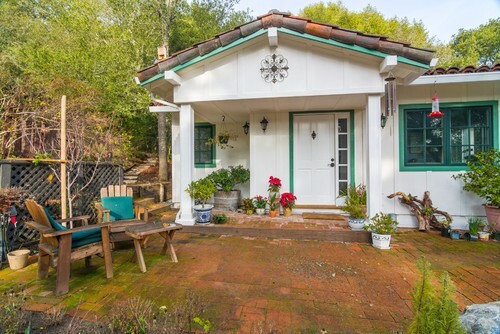 Another wonderful small cottage to swoon over. Happy Saturday. Yes, I COULD (live there)! 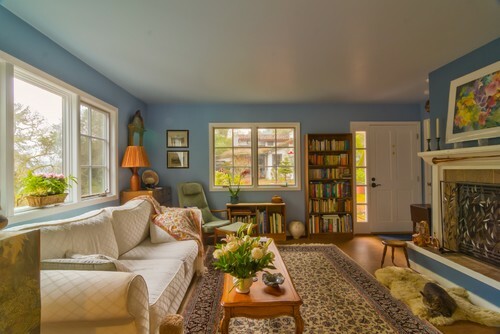 Oh, I love that barn door and the big window over the kitchen sink. Having a window over the kitchen sink is a huge priority with me. I spend so much time at the kitchen sink that cannot imagine staring at a wall. 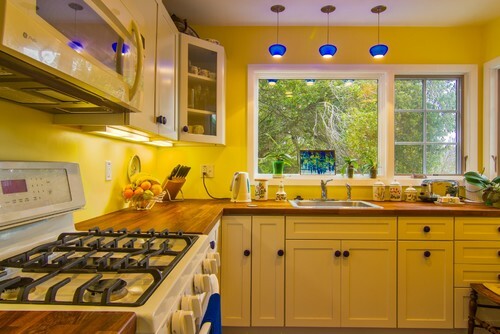 I love how bright and cheery that kitchen is and the blue light fixtures add so much charm. I absolutely love the front of the house, and the interior is charming! Why, yes! I could live there! The rooms are lovely and look larger than I expected. 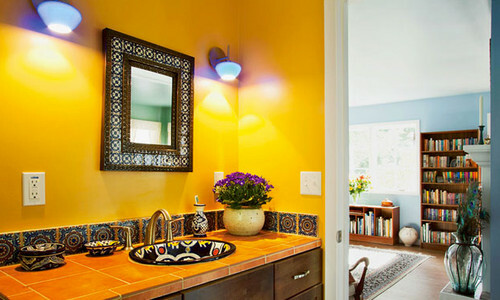 I love the bold colors that they chose to decorate. How fun! I love it and it would be perfect for me and David. You find the perfect cottages to show us. It has such a feeling of space to it, the rooms seem huge! Love, love, love it. I could see myself here. i agree. It's very inviting, and I love the natural beauty that surrounds it. What a cute cottage. I have to agree in that it does seem bigger than it is. Lovely! This is exactly what our daughter hopes to do for us someday when it's time to give up our home. I'm already making lists of only my very favorite things to take, and it looks as if these owners did exactly that. It's the best of both worlds, independent living and yet the security of being close at hand when needed or wanted. I think the house has a youthful spirit, very nice! Good morning Nancy! 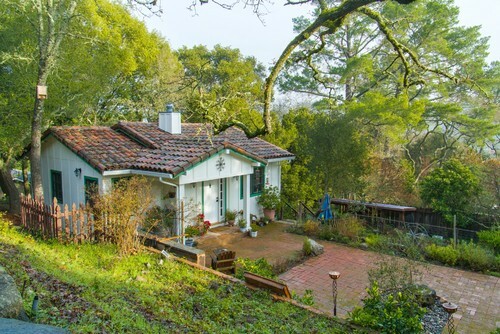 Lovely are those Spanish cottages in California; I lived in one from birth to age 12 and that was my favorite home. And I love what you said that a home should reflect the owner, not that of a designer. 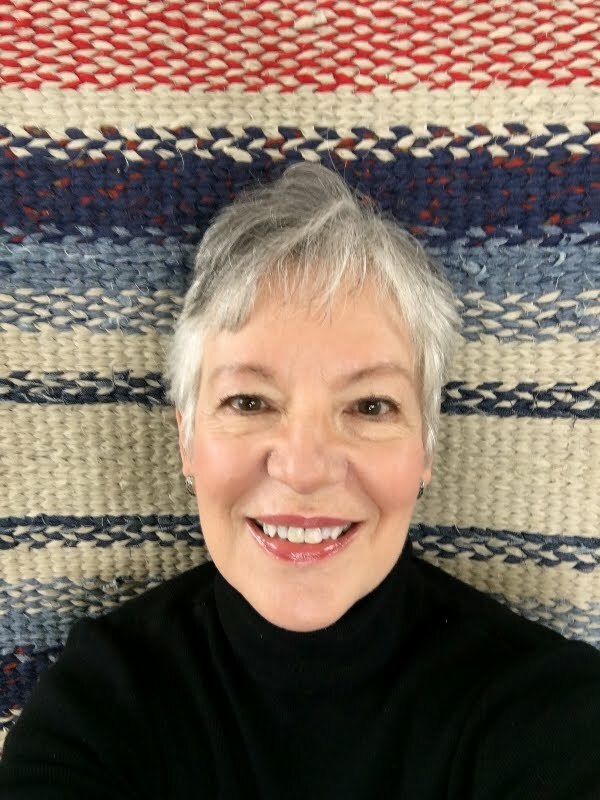 For those who can afford a designer, that is great because designers can help the owner find their style, but for the rest of us, finding our expression to who we are is a FUN journey of trial and error, but when we find what makes us comfortable, it is so satisfying! Lovely little home, as always. I could definitely live there. And I love mixing styles. Very charming inside and out. That's one thing about Northern California, the outdoor spaces are beautiful. The Cottage is adorable, it's a little too colourful for me, but if it reflects the owner's personality, then it's perfect! 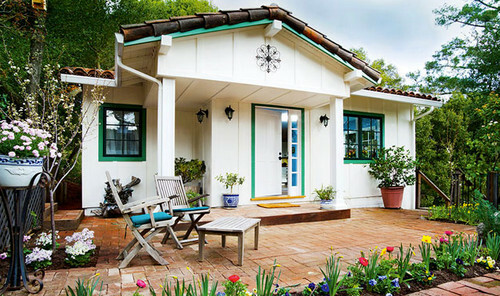 It's simply a darling adorable cottage! I think I could live there, but I would need a little craft/sewing/office room! 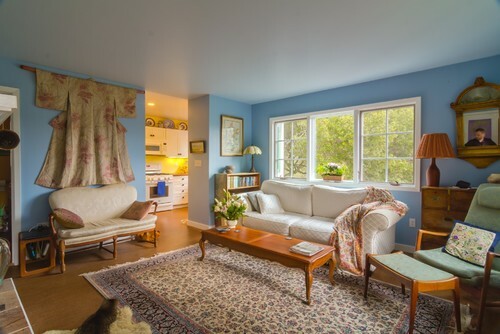 The colors and decor are perfect and make the the inside look very spacious! Have a wonderful day! Very warm and comfy . . . Yes, I could live there! It's a great little home and I love the fact that the family has the grandmother close by on their property.